The Halifax Makerspace is a collection of makers and dreamers from Halifax. The Nelson Mania project was started, and continued through to completion without a dedicated physical makerspace. Over its 2 year run, many individuals participated. Four of the more active members are interviewed here. Nelson Mania can be viewed and played at Hal-con, in the arcade, November 4-6, 2016, and hopefully for many Hal-cons to come. What is the project? How was it conceived? It’s a pinball machine, themed around Hal-con, Halifax’s comic/fantasy/sci-fi fan convention, and its anthropomorphic robot mascot, Nelson. The cabinet came from an old 1985 Space Shuttle game, the rest is entirely new. Peter has a foot in both the maker and Hal-con gaming camps. He put out a call to the Halifax Makerspace Google Group (here) asking if anyone would be interested in making a pinball machine. As none of us knew anything about pinball at the time, we figured why not jump in the deep end? We got a dozen or so people to come to the initial meeting. Some dropped out as life intruded and more were conscripted or enticed to join. We started building in the Discovery Centre’s workshop, then later moved to Shawn’s garage and basement when that space was no longer available. What was your favorite learning experience or learned skill in doing this build? FROM PETER: All of my arduino projects before this one have lived entirely at a prototype stage. They’re assembled (on a breadboard), tinkered with, and eventually disassembled when I need the parts (or the board) for something else. The pinball project was entirely different. I knew that a pinball cabinet would be no place for a breadboard, so I decided to design my own arduino pinball shield. I started by soldering a couple of MOSFETs to a protoshield, and that worked well enough. They could deal with the current and voltage needed to drive a pinball solenoid. But they required very specific driving characteristics, which were easy to foul up, so they frequently released their magic smoke. That’s when I decided to look online for existing solenoid driver circuits. I found one that paired TIP102s and TIP36Cs. People will tell you that they are obsolete parts but they are inexpensive in quantity, and can tolerate a lot of misuse. I also enjoyed writing really low-level firmware for the arduinos to read the switches and drive the solenoids. The stock arduino library is awesome when you want to get something working quickly, and you can afford to be a little wasteful of clock cycles and memory. Pinball, on the other hand requires very specific timing and the ability to track a dozen events at once. So, I wound up writing my own really simple multitasking kernel based on protothreads. FROM ADAM C.:I have 3d printed a bunch of stuff through the paid service that the Dalhousie University Libraries offer and the Makerspace has a RepRap 3d printer that we made a few years ago, but it was always quite unreliable. For this project it seemed like 3d printing would be a great option for producing custom mounting brackets for the LEDs we were using to light the playfield. I had been casually considering buying a cheap 3d printer before this project and this gave me the nudge to actually do it. Monoprice.com released an entry level printer that was getting some great reviews so I made the leap. I’m a programmer by trade so it made sense that I started designing the mounts using OpenSCAD, a CAD program that uses scripting to generate objects. Like 3d printing, I had used OpenSCAD a bit in the past but didn’t feel overly competent using it. This project gave me the chance to model a variety of different LED lighting mounts and really helped me boost my skills in OpenSCAD. When getting objects printed at Dal all I had to do was send them the design file and then go pick up my object when it was ready. Having my own 3d printer gave me much faster turn around time for prototyping and redesigning but it’s a bit like owning a car back in the days of the Model-T. You need to learn how to fix/modify/maintain your equipment just as much as how to use it. I still feel like I’m in the early learning stage of dialing in my printer to get quality prints. But compared to what I knew when I first unboxed it I have learned a TON! There is one complex LED mount that I’m particularly proud of because of how smoothly it worked out, but most of those will never be seen by most people. But I think my favourite contribution is the custom pop-bumper caps. I learned a bunch in trying to get the quality print and I think they turned out fantastic. FROM ADAM S.: Working on this project has been quite the experience for me, and has definitely been a labour of love. The wide range of skills each of our full and part time contributers has been wonderful for both the construction of the actual game, and learning what each other brings. The pinball project over the past 2 years has given me a new hobby and pastime. Since we began, I’ve bought 4 commercial games of my own to both play and fix. Doing so has taught me a lot about all the mechanical and construction aspects of pinball. I have brought the wiring and some of the pinball gameplay knowledge into the group. I can be seen playing and fixing my games live on Twitch. FROM SHAWN: This is hard to answer, as the thing I liked most about the project was the huge range of skills we had to learn to complete it. It touched on woodworking, welding, vacuum forming, 3D modelling, 3D printing, programming, electronic design, script writing, sound recording and editing, CNC routing, project management, and a bunch of others. But to choose the one that surprised me most, I’d have to say the laser cutter. 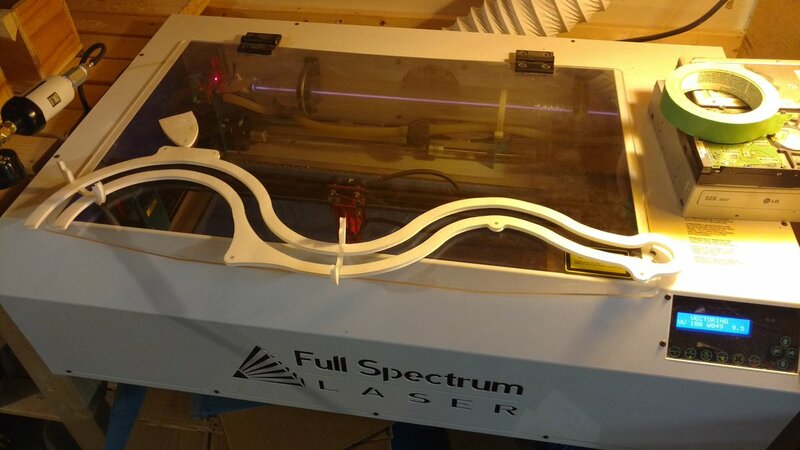 The Makerspace has a Full Spectrum 20×12 45W laser cutter. When we started, I knew nothing about it, and could hardly fathom how useful 2D shape cutting could be, when compared to 3D printers and 2D hand cutting. I was shocked how often the solution to one problem or another came down to the laser. We’d use it to quickly and cheaply prototype holes that would eventually be CNCed, fixing most of our mistakes with cardboard, paper, and foamboard instead of expensive hardwood plywood and acrylic. We used it cut custom lens diffusers, to assemble clamping jigs for wire ramps, to cut stencils for spray painting, to cut and engrave an acrylic raised playfield, to engrave little “thank-you” plaques, to test fit our plastics before sending to the printer, and a dozen other things. It’s an absolutely fantastic piece of equipment and I feel lucky to have been able to learn its strengths and limitations over the course of the project.